We've updated this series to include the January release of the Consumer Price Index as the deflator and the January monthly employment update. The latest hypothetical real (inflation-adjusted) annual earnings are at $38,957, down 11.4% from 45-plus years ago. The Bureau of Labor Statistics has been collecting data on this workforce cohort since 1964. The government numbers provide some excellent insights on the income history of what we might think of as the private middle-class wage earner. The first snapshot shows the growth of average hourly earnings. The nominal data exhibits a relatively smooth upward trend. There are, however, two critical pieces of information that dramatically alter the nominal series: The average hours per week and inflation. The average hours per week has trended in quite a different direction, from around 39 hours per week in the mid-1960s to a low of 33 hours at the end of the last recession. The post-recession recovery has seen a trivial 0.7 bounce (that's 42 minutes). What about inflation? 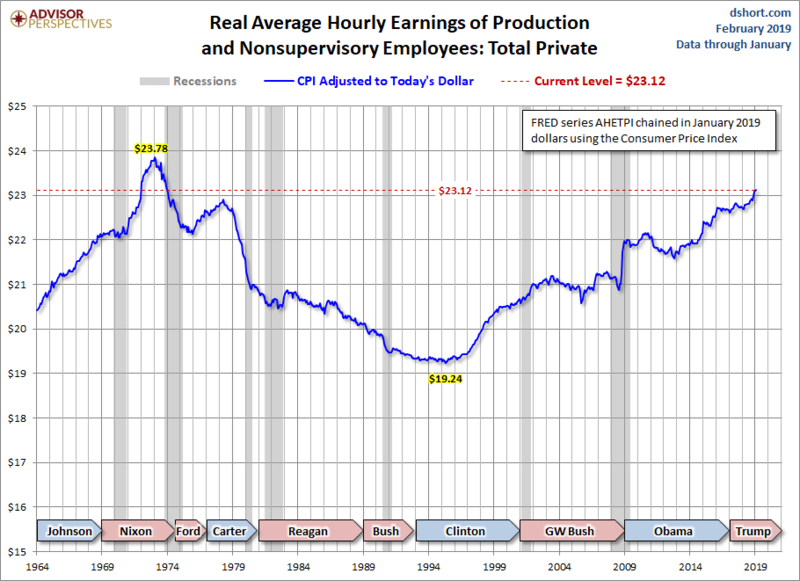 The next chart adjusts hourly earnings to the purchasing power of today's dollar. We've used the familiar Consumer Price Index for Urban Consumers (usually abbreviated as the CPI) for the adjustment with a linear extrapolation for the latest month. Theoretically, the CPI is designed to reflect the cost-of-living for metropolitan-area households. We use a linear extrapolation to compute the latest monthly inflation data until the mid-month release of the official CPI data. 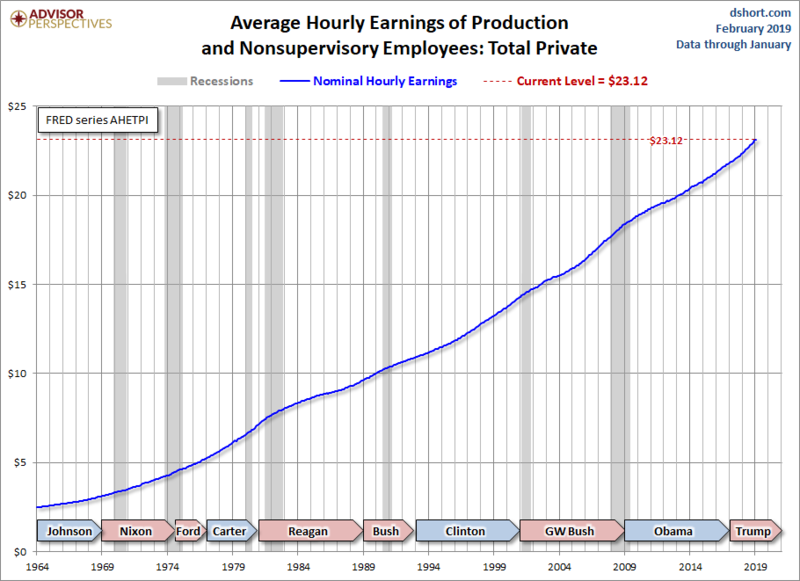 Now let's multiply the real average hourly earnings by the average hours per week. 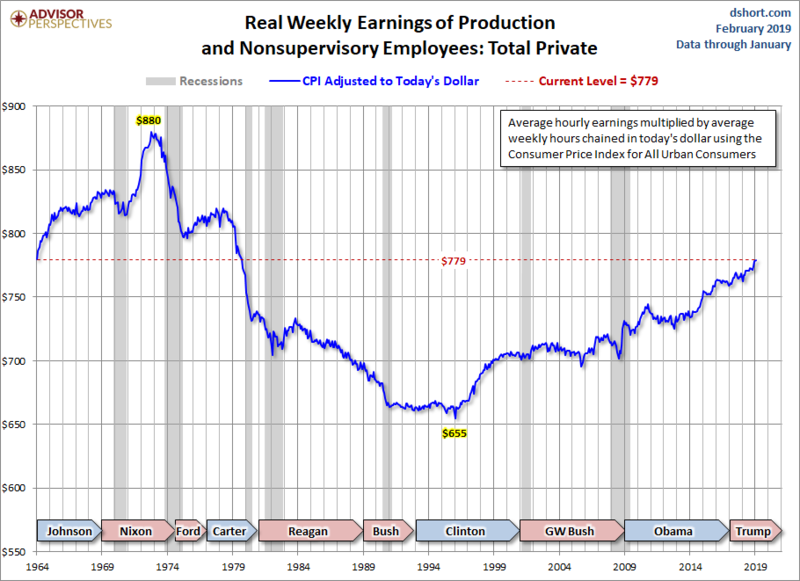 We thus get a figure for average weekly earnings of this middle-class cohort, currently at $779 — well below its $846 peak back in the early 1970s. Note that this is a gross income number that doesn't include any tax withholding or other deductions. Disposable income would be noticeably lower.